Citrix NetScaler Management and Analytics System (MAS) is a centralized management solution that provides administrators with the ability to manage and monitor Citrix application networking products from a single, unified console. NetScaler MAS includes a number of modules including Web Insight, HDX Insight, Gateway Insight, Security Insight, SSL Insight, TCP Insight, Video Insight, and WAN Insight. For an organization using Citrix XenApp or XenDesktop, HDX Insight is the one that is most applicable. NetScaler MAS collects monitoring information from the network, using the NetScaler devices as data sources. Hence, the monitoring is 100% agentless – no agents are required on the XenApp servers or XenDesktop VMs. Network latency from different geographic locations: This is useful for troubleshooting – e.g., if users from a specific location are having latency problems compared to others. HDX round-trip time vs. network round-trip time for each and every user session: For long, Citrix admins have believed that many Citrix issues are being caused by poor network connections. With MAS, they can compare the HDX and network latency. If both latencies are high, it is clearly due to the network (because the HDX protocol operates above the network layer). MAS also breaks network latency into WAN latency and data center (DC) latency. If the WAN latency is high, it points a problem in the user’s connection to the Citrix farm. On the other hand, DC latency is attributable to the data center network. What sessions are in progress: This can be useful for determining the usage of your XenApp and XenDesktop services. How HDX virtual channels are being used: NetScalers, the source of MAS’ data, can tap into the HDX channels and report on the bandwidth usage over each HDX virtual channel. Lacks support for synthetic monitoring of Citrix user experience: Over the years, it has been well established that synthetic monitoring is an effective way of tracking Citrix user experience. One form of synthetic monitoring is the Citrix Logon Simulator, a tool that repeatedly logs into a Citrix farm every few minutes and reports on the success/failure of Citrix logins and the availability of applications. Lacks visibility into all aspects of real user experience: Slow Citrix logins have often been a big problem for Citrix admins. NetScaler MAS does not report on Citrix login times. And if Citrix login is slow, NetScaler MAS cannot provide insights into why: is it due to Active Directory authentication, GPO processing, logon script processing, etc. These details require insights gleaned from the XenApp servers and XenDesktop VMs. Being a network-centric tool, NetScaler MAS does not have this visibility. No server-side view: NetScaler MAS has only a network-based view of performance. It has no insights into what is happening on the XenApp servers or XenDesktop VMs. So, consider a case where a memory leak in one of the applications is slowing accesses to XenApp servers. NetScaler MAS will report that HDX latency is high, but it cannot diagnose the problem to a memory leak in the specific application. And if you want to plan for capacity growth, the first thing you need to determine is how much more CPU or memory or disk or servers you need to add – something you cannot get from NetScaler MAS. No visibility into specific Citrix tiers: Citrix architectures today have a multitude of tiers. In-depth insights into the performance of these tiers is required to troubleshoot problems quickly. For example, a Citrix VDA may be in an unregistered state on the delivery controller because of a time synchronization issue. A Citrix PVS server may be causing slowness because of many device retries. Detailed insights and KPIs into each of these tiers is required for effective Citrix performance management. It is not an end-to-end performance monitoring solution: Performance issues in Citrix supporting components – virtualization, storage, cloud, Active Directory, profile servers, etc. can result in Citrix slowness. NetScaler MAS does not have insight into these components. 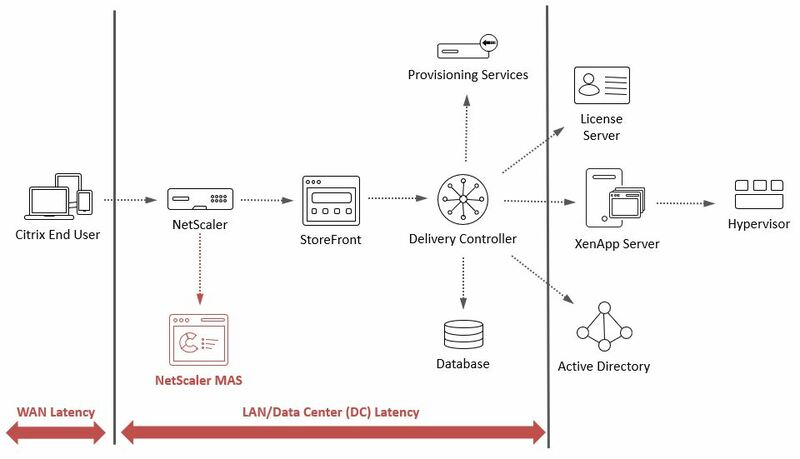 Therefore, even if you have deployed, or are considering deploying, Citrix NetScaler MAS, you will need to augment this with tools that provide you with the server-side view of the infrastructure. After all, a decade ago, Citrix technologies used to be referred to as “Server-Based Computing”! 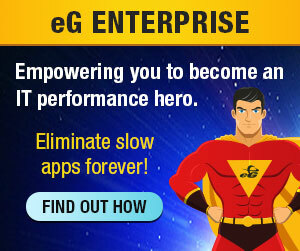 eG Enterprise for Citrix XenApp and XenDesktop complements Citrix NetScaler MAS. You have eG Enterprise integrate with NetScaler MAS and provide a total end-to-end view of Citrix performance – from network to server, from desktop to storage, and from user experience to application process usage.